Chemical warfare involves the use of natural or synthetic (human-made) substances to disable or kill an enemy or to deny them the use of resources such as agricultural products or foliage in which to hide. The effects of the chemicals may last only a short time, or they may result in permanent damage and death. Most of the chemicals used are known to be toxic (poisonous) to humans or plant life. In some cases, normally harmless chemicals have also been used to damage an enemy's environment. Such actions have been called ecocide and are one method for disrupting an enemy's economic system. The deliberate dumping of large quantities of crude oil on the land or in the ocean is an example of ecocide. The appeal of chemicals as agents of warfare is their ability to cause mass casualties or damage to an enemy with only limited risk to the forces using the chemicals. Poisoning a town's water supply, for example, poses almost no threat to an attacking army. Yet the action could result in the death of thousands of the town's defenders. In many cases, chemicals are not detectable by the enemy until it is too late for them to take action. Chemical warfare dates back to the earliest use of weapons. Poisoned arrows and darts used for hunting by primitive peoples have also been used as weapons in battles between tribal groups. In 431 B.C. , the Spartans used burning sulfur and pitch to produce clouds of suffocating sulfur dioxide in their sieges against Athenian cities. When the Romans defeated the Carthaginians of North Africa in 146 B.C. , they destroyed the city of Carthage and spread salt on surrounding fields to destroy the agricultural capability of the land. The Romans' intent was to prevent the Carthaginians from rebuilding their city. Chemical agents can be classified into several general categories, ranging from those that cause relatively little harm to those that can cause death. One group includes those that produce only temporary damage. As an example, tear gas tends to cause coughing, sneezing, and general respiratory discomfort, but this discomfort passes within a relatively short period of time. Other agents cause violent skin irritation and blistering and may result in death. Still other agents are poisonous and are absorbed into the victim's bloodstream through the lungs or skin, causing death. Nerve agents attack the nervous system and kill by causing the body's vital functions (respiration, circulation, etc.) to cease. Finally, other agents cause psychological reactions including disorientation and hallucinations. Defoliant: A chemical that kills the leaves of plants and causes them to fall off. Ecocide: Deliberate attempts to destroy or damage the environment over a large area as a tactical element of a military strategy. Harassing agent: A chemical that causes temporary damage to animals, including humans. Herbicide: A chemical that kills entire plants, often selectively. Nerve agent: A chemical that kills animals, including humans, by attacking the nervous system and causing the disruption of vital functions such as respiration and heartbeat. Another group of chemical agents include those that attack vegetation, damaging or killing plants. Some examples include defoliants that kill a plant's leaves, herbicides that kill the entire plant, and soil sterilants that prevent the growth of new vegetation. Antipersonnel agents: chemicals used against people. 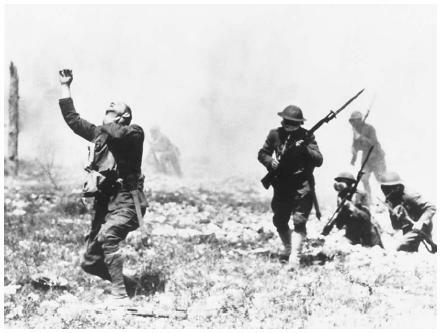 The first large-scale use of poisonous chemicals in warfare occurred during World War I (1914–18). More than 100,000 tons (90,000 metric tons) of lethal chemicals were used by both sides in an effort to break the stalemate of endless trench warfare. The most commonly used chemicals were four lung-destroying poisons: chlorine, chloropicrin, phosgene, and trichloromethyl chloroformate, along with a skin-blistering agent known as mustard gas, or bis(2-chloroethyl) sulfide. These poisons caused about 100,000 deaths and another 1.2 million injuries, almost all of which involved military personnel. Germany, Russia, and other countries all continued development of these weapons during the period between World War I and World War II (the 1920s and most of the 1930s). This research included experimentation on animals and humans. Although chemical weapons were not used very widely during World War II (1939–45), the opposing sides had large stockpiles ready to deploy against military and civilian targets. During the civil war in Vietnam, the U.S. military used a "harassing agent" during many of its operations. (The United States sided with and supplied the South Vietnamese in the early 1960s and joined their military efforts against the North in 1964.) The agent was a tear gas known as CS or o-chlorobenzolmalononitrile. CS was not regarded as toxic to humans and was intended only to make an area uninhabitable for 15 to 45 days. A total of about 9,000 tons (8,000 metric tons) of CS were sprayed over 2.5 million acres (1.0 million hectares) of South Vietnam. Although CS was classified as nonlethal (not deadly), several hundred deaths were later reported when the gas was used in heavy concentrations in confined spaces such as underground bunkers and bomb shelters. Poisonous chemicals were also used during the Iran-Iraq War of 1981–87, especially by Iraqi forces. During that war, both soldiers and civilians were targets of chemical weapons. Perhaps the most famous incident was the gassing of Halabja, a town in northern Iraq that had been overrun by Iranian-supported Kurds. The Iraqi military attacked Halabja with two fast-acting neurotoxins, sarin and tabun. Sarin and tabun cause rapid death by interfering with the transmission of nerve impulses. Muscular spasms develop and a person dies when he or she is no longer able to breathe. About 5,000 people, mostly civilians, were killed in this incident. Use of herbicides during the Vietnam War. Herbicides are chemicals that were originally developed to kill weeds. However, they are just as effective at killing agricultural crops as they are at killing weeds. During the Vietnam War, in addition to tear gas, the U.S. military relied heavily on the use of herbicides as a weapon of war. The purpose of using herbicides was two fold: first, to destroy enemy crops and disrupt their food supply, and second, to remove forest cover in which enemy troops might hide. Between 1961 and 1971, about 3.2 million acres (1.3 million hectares) of forest and 247,000 acres (100,000 hectares) of Vietnamese croplands were sprayed at least once. This area is equivalent to about one-seventh of the total land area of South Vietnam. The most commonly used herbicide was called Agent Orange, a blend of two herbicides known as 2,4-D and 2,4,5-T. Two other herbicides, picloram and cacodylic acid, were also used, but in much smaller amounts. In total, about 25,000 tons of 2,4-D, 21,000 tons of 2,4,5-T, and 1,500 tons of picloram were utilized as a result of U.S. military actions during the war. In particular, Agent Orange was sprayed at a rate of about 22.3 pounds per acre (25 kilograms per hectare). This rate is equivalent to about 10 times the rate at which those same chemicals are used for plant control purposes in forestry. The higher spray rate was used in Vietnam because the intention of the U.S. military was the ultimate destruction of Vietnamese ecosystems (its communities of plants and animals). herbicides, a total of about 272,000 acres (110,000 hectares). Almost all of the plant species of mangrove forests proved to be highly vulnerable to herbicides, including the dominant species of tree, red mangrove. Severe ecological effects of herbicide spraying were also observed in the biodiverse upland forests of Vietnam, especially its rain forests. Mature tropical forests in this region have many species of hardwood trees. These forests are covered by a dense canopy consisting of complex layers. As a result, a single spraying of herbicide typically kills only about 10 percent of the larger trees. However, the goal of the U.S. military was to achieve a more extensive and longer-lasting defoliation. Hence, they sprayed many areas more than once. In fact, about 34 percent of Vietnam was treated with herbicides more than once. The effects on animals of herbicide spraying in Vietnam are not well documented. However, there are many accounts of reduced populations of birds, mammals, reptiles, and other animals in the mangrove forests treated with herbicides. In addition, large decreases in the yield of nearshore fisheries have been attributed to the spraying of mangrove ecosystems, which provide spawning and nursery habitat for the fish. The effects on wild animals were probably caused mostly by habitat changes resulting from herbicide spraying. However, there have also been numerous reports of domesticated agricultural animals becoming ill or dying. Because of the constraints of warfare, the specific causes of these illnesses and deaths were never studied properly by veterinary scientists. However, these ailments were commonly attributed to toxic effects of exposure to herbicides, mostly ingested by the animals with their food. Use of petroleum as a weapon during the Persian Gulf War. Large quantities of petroleum are often spilled at sea during warfare, mostly as the result of damage to oil tankers or other facilities such as offshore production platforms. During the Iran-Iraq War of the 1980s and the Persian Gulf War of 1991–92, however, oil spills were deliberately used to gain military advantage, as well as to inflict economic damages on the enemy's postwar economy. The world's all-time largest oceanic spill of petroleum occurred during the Persian Gulf War. The Iraqi military deliberately released almost 1 million tons (900,000 metric tons) of crude oil into the Persian Gulf from several tankers and an offshore facility for loading tankers. In part, the oil was spilled to establish a defensive barrier against an expected attack by the anti-Iraqi coalition forces. The hope was that igniting the immense quantities of spilled petroleum would create a floating inferno that would provide an effective barrier against a seaborne invasion. It is believed that the Iraqis also sought to contaminate the seawater used in desalination plants (salt removal facilities) that supply most of Saudi Arabia with freshwater. The first treaty to control the use of chemical weapons was the Geneva Protocol, agreed upon in 1925 and subsequently signed by 132 nations. This treaty was prompted by the horrible uses of chemical weapons during World War I. It banned the use of asphyxiating (suffocating), poisonous, or other gases, as well as bacteriological (germ) methods of warfare. In spite of having signed this treaty, however, all major nations are known to have continued research on new and more effective chemical and bacteriological weapons. In 1993, negotiators for various nations met at a Chemical Weapons Convention and agreed to the destruction of all chemical weapons within a 10 to 15 year period following ratification of a chemical weapons treaty. By the end of 2000, 174 nations had signed, ratified, or acceded to the treaty. In the long run, its effectiveness depends upon its ratification by all countries having significant stockpiles of chemical weapons, the countries' commitment to following the terms of the treaty, and the power of an international monitoring program to expose and discipline member countries ignoring the treaty. Part of the problem in obtaining an effective chemical weapons treaty is desire. Nations have to want to destroy their stockpiles of weapons and discontinue making more of them. Another part of the problem is cost. By one estimate, it will cost $16 to $20 billion just to safely destroy the chemical weapons of the world's two largest military powers, the United States and Russia. I'm searching for information about US weapons of gas warfare during the Vietnam war. So far I have only found some undated photo magazines from Vietnam. Can anybody helt? im interested in the agent B.Z., i believe its an nerve agent. also was there more than four chemical agents used in viet-nam ? would like to have this info at home to read while studying ethics in school. I'm trying to find the effects that chemical weapons have on the economy, can anyone help me?